Mary C. Clement has been researching the hiring of new teachers for over twenty years, and received the 2013 Star Award from the American Association for Employment in Education for her writing in the field of k-12 teacher hiring. Thomas Kersten, a former superintendent, is associate professor of educational leadership at Roosevelt University in Schaumburg, Illinois, discusses a teacher hiring process. Facilitated by Texas Association of School Administrators (TASA), the Texas Teacher of the Year Program annually recognizes and rewards teachers who have demonstrated outstanding leadership and excellence in teaching. TASPA is in partnership with the law firm of Walsh, Anderson, Gallegos, Green and Treviño, P.C., proudly present the 2014-15 Webinar Series. This webinar series is a TASPA member benefit and will be presented at no charge to TASPA members. The TASPA membership directory is now available exclusively to our TASPA members. Members must be logged in to access the directory. Are you looking for more productive ways to connect with teacher candidates? 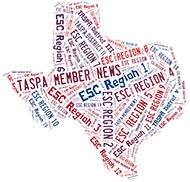 TASPAHRConnection is an e-newsletter sent out quarterly to TASPA members. Send comments and questions regarding newsletter submissions to Chandelle Crane at ccrane@taspa.org.